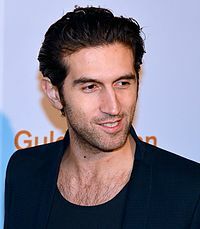 Josef Fares (born 19 September 1977) is a Swedish-Lebanese film director and game designer. His brother is the actor Fares Fares, who has appeared in many of his films. Josef Fares moved to Sweden when he was 10 years old, fleeing the Lebanese Civil War with his family. Variety declared him one of ten upcoming directors to watch in 2006. The same year he won the Nordic Council Film Prize for his film Zozo. In 2013, he directed his first video game, Brothers: A Tale of Two Sons. The game was well received by critics. Its focus is on the interaction between two brothers and on their journey to save their father. His next video game was released 23 March 2018, A Way Out. On December 7, 2017, Josef appeared on The Game Awards 2017 and gave a "passionate" speech while on stage with host Geoff Keighley, where he covered many topics like the Oscars, EA's microtransaction controversy with Star Wars Battlefront II, and his game A Way Out. Because of his speech, he has received international praise among fans and his speech has created a new Internet meme involving mass vandalism of relevant Wikipedia pages, usually to reference the 2003 movie The Room, as many people compared him to the movie's director, Tommy Wiseau. ^ "Josef Fares – The Swedish Film Database". Retrieved 2017-12-09. ^ "Josef Fares – Svensk Filmdatabas". Retrieved 2018-03-23. ^ a b Mahardy, Mike (2013-10-27). "Brothers: How a film director shook up Starbreeze". Polygon. Retrieved 2017-10-27. ^ "Zozo wins Nordic Council Film prize". Cineuropa - the best of european cinema. Retrieved 2017-10-27. ^ "A Way Out | Metacritic". metacritic.com. Retrieved 2018-04-06. ^ Fares, Josef (7 December 2017). "So exited for A way out! Boom and have a great day!". @josef_fares. Retrieved 2017-12-08. ^ Kim, Matt (2017-12-08). ""F*** the Oscars" - Fans React to A Way Out Director's Wild Game Awards Rant". USgamer. Retrieved 2017-12-08. This page was last edited on 11 April 2019, at 06:03 (UTC).